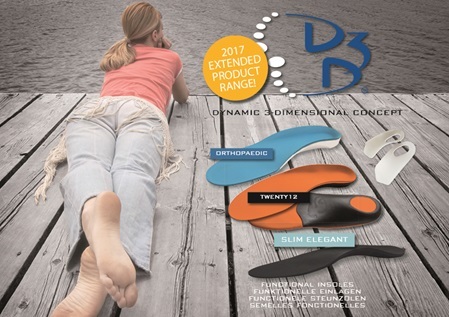 Two new slim elegant insoles and a new intermediate layer (for calcaneal spur insoles). 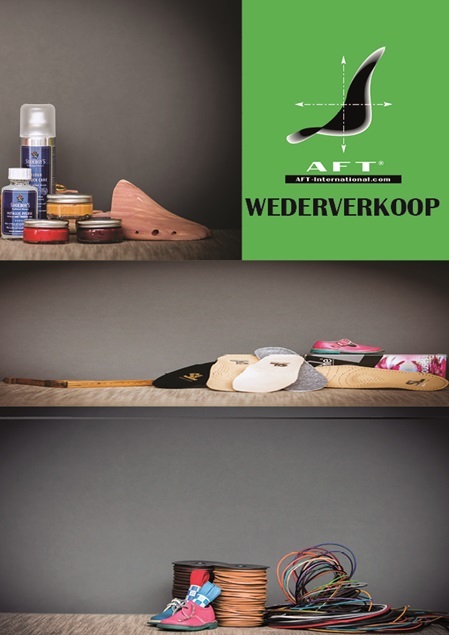 AFT International launches two new top covers, two new slim elegant insoles and a new intermediate layer (for calcaneal spur insoles). 2 new Top covers in our latest and most advanced EVA materials which are used for Diabetics (Elastoflex/15) and Sports insoles (Highflex/25) because of its high rebounding effect. 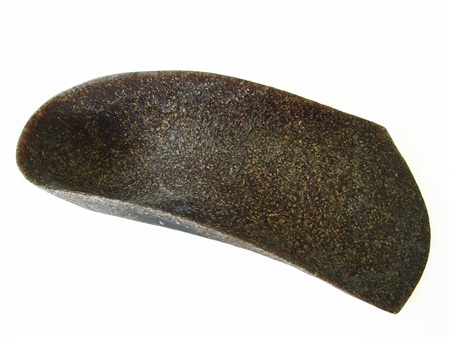 A new layer to use in insoles for patients with heel(calcaneal) spur. With cut-out for cushioning the heel zone while relieving the tendon. Can be used as an intermediate layer with PPT in the cut out in all our Slim Elegant insoles. Also, separately available in 2 different hardness’s. Finally, Slim elegant insoles with the best shock absorbing product PPT. The new Thermytex cover is our latest generation of synthetic cover materials, with a much higher quality than the former Skai. Its main added value is high absorption of humidity! 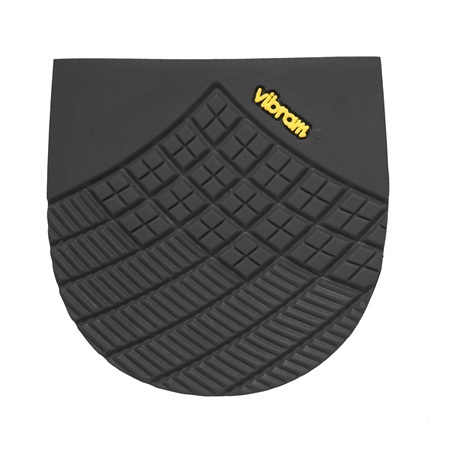 The Vibram Long Haul sole offers 50 % less weight than a solid rubber sole while providing a very good abrasion resistance. The Long Haul heel is a toplift of 6 mm soft rubber which ensures excellent grip and a long-lasting resistance. AFT International presents a full range of antistatic materials that have been tested and certified against electrostatic charge. Below you can find a list of antistatic products that can be used for the production of work shoes as well as insoles. 1. 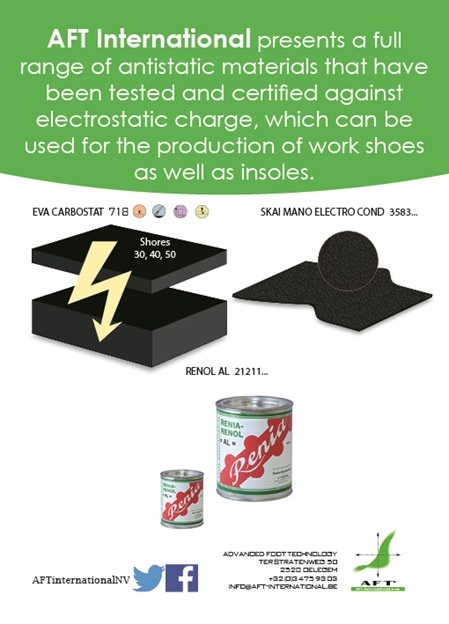 EVA Carbostat: An antistatic EVA material, available in different shores and thicknesses to build up work shoes or for the production of complete insoles as well as the coverage of them. EVA Carbostat is also available as milling material. 2. Skai Mano: Ideal cover material to protect work shoes and/ or orthotics against electrostatic charge. Easy to glue, sew or nail. 3. Renol AL: Antistatic, toluene-free adhesive to be used for the gluing of materials for anti-static work shoes and (in)soles. 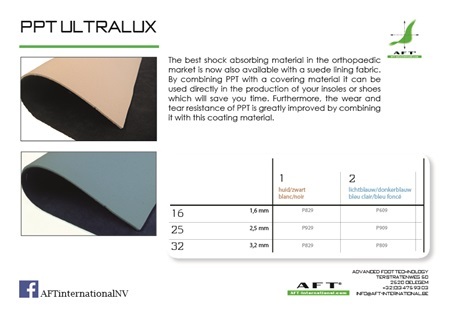 The best shock absorbing material in the orthopaedic market is now also available with a suede lining fabric. By combining PPT with a covering material it can be used directly in the production of your insoles or shoes which will save you time. Furthermore, the wear and tear resistance of PPT is greatly improved by combining it with this coating material. This very high quality outsoles material aims to achieve maximum slip resistance. The product has a very innovative profile design and is specially developed for work shoes. 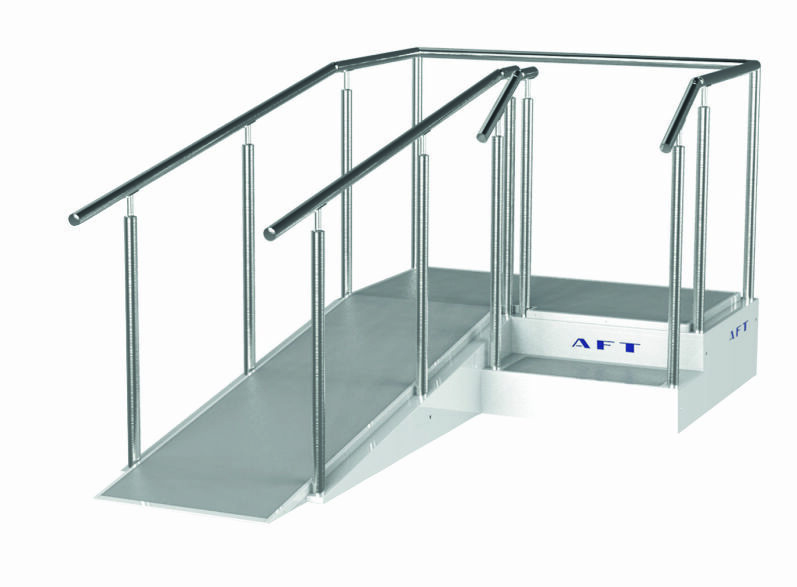 It has been tested and approved by TÜV and PFI for its extraordinary slip resistance. The rubber quality used here is antistatic and oil, fuel and acid resistant, allowing it to be used in a lot of applications. 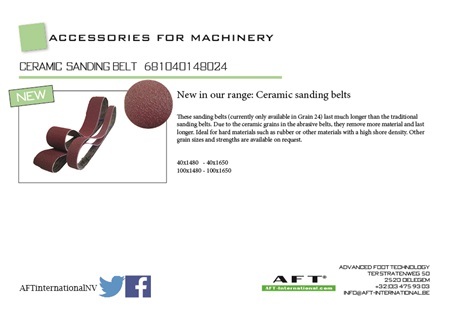 These sanding belts (currently only available in Grain 24) last much longer than the traditional sanding belts. Due to the ceramic grains in the abrasive belts, they remove more material and last longer. Ideal for hard materials such as rubber or other materials with a high shore density. Other grain sizes and strengths are available on request. 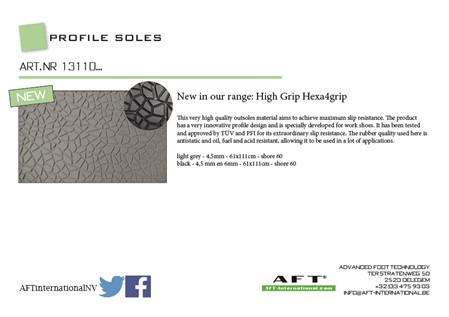 New in our range of orthopedic shoe technology! reinforcing layer between the outer sole and the insole. The advantage of Cellulose is that the material can absorb a high amount of moisture, which leads to an increased comfort in your shoes. Available in sheets (3mm thickness) of 1.5m² or cut into the desired shape. AFT International presents to you its basic package for podiatry. 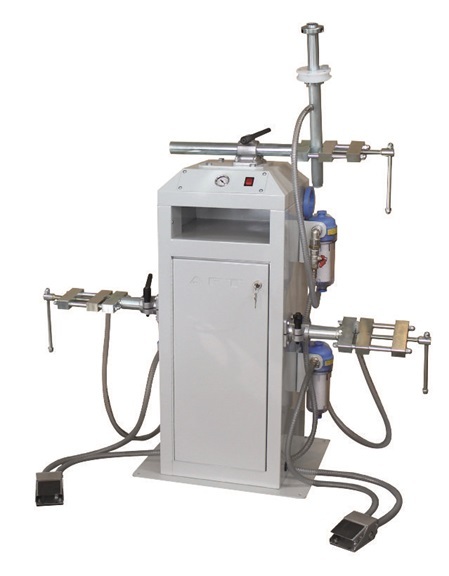 The package contains the different scouring machines which are used in today's market. 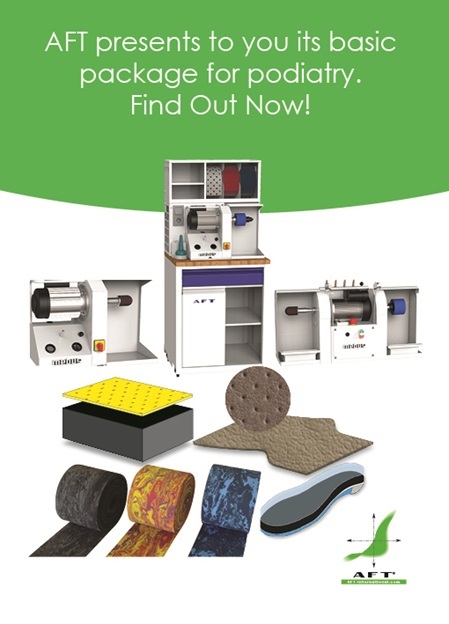 These high quality machines are equipped to tailor and/or to finish the best insoles for your patients. In addition to classic leather linings AFT highlights a range of different synthetic cover fabrics of high quality. 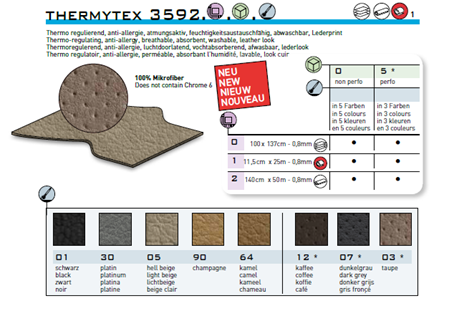 Synthetic fabrics "Thermytex" with its genuine leather look and highly absorbent character and Alcantara synthetic fabric "Suetex" with a natural suede surface, are presented here. Furthermore, the insoles can also be covered with an EVA material that is, as you will see, available in a range of colour combinations and patterns. To build up and/or correct your insoles we offer a very wide range of EVA materials in several shore densities, thicknesses and colours. Not to mention, AFT is the supplier of the only real PPT. PPT is a superb shock-absorbing material that is used in the whole orthopaedic world for many different applications. Discover our brand new high quality shoe care products, shoe laces and inlays. 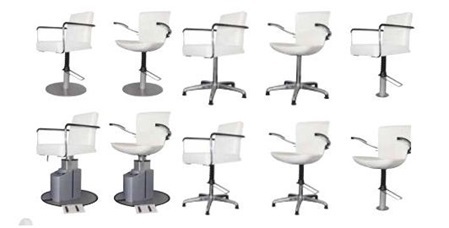 Because our objective is to offer our customers the best price-quality products, AFT International NV has thoroughly renewed and improved these product ranges. Contact us and find out our very favorable conditions! AFT International launches new moulded shell models in hard cork material. The AFT CORK BASE products are currently available in the Shell and MEDIUM form. The MEDIUM model is also available in a normal and wider implementation. These new models as a basis for molding your orthotics have an excellent price vs. performance Ratio. 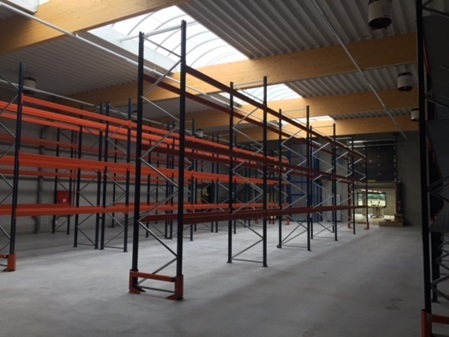 In order to serve our customers in a faster and better way, AFT Intl Belgium has expanded its building in 2015. Next to the existing premises we have built an additional 1,500 m² new business space to support our recent and future growth. Beside the new storage space and production area we created a new showroom to welcome our customers and suppliers with all decency. Simultaneous laminating at 5 workstations on only 3 meters in length, incl. extraction hood over the entire length. All 5 stations are equipped with a prism holder and can be tilted forward. Directly behind each station are 2 controllable vacuum connections available. 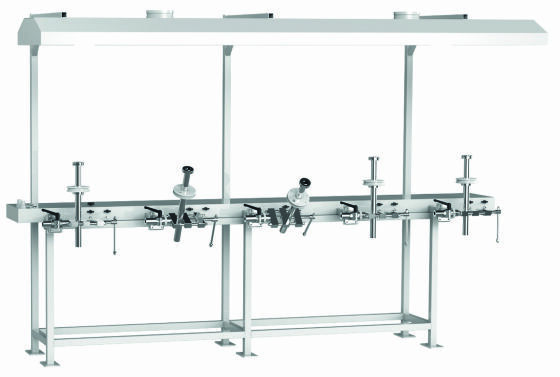 The Lamination Line can be combined and thus extended. The suction hood must be connected to a central suction system. Our most recent developments with EVA materials resulted in 2 brand new extraordinary products. Elastoflex is a new EVA mixture with a much higher elasticity and rebounding effect than all the other traditional EVA articles available on the market. This new article is available in Shore A15 and A20 in all thicknesses. 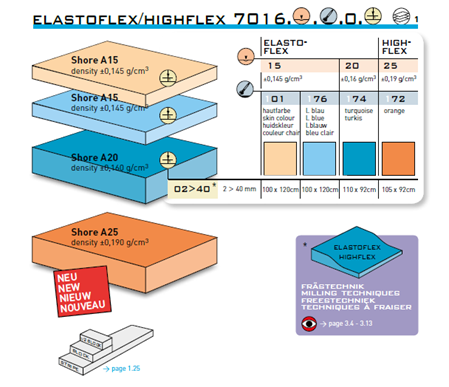 Even more recent is the new product Highflex with an extreme high elasticity and is available in Shore A25 in all thicknesses. These products are ideal as an innersole material, covering, as a layer of CADCAM milling blocks and much more. Up to 3 Thermoforming jobs in one station, each station can be tilted forward and has its own prism-holder and vacuum water separator. Integrated vacuum system of 80 cbm/h with integrated tank of 15 liters. 2 stations are controllable by footswitch. The vacuum system is protected by an integrated dust particle filter. For tools a small storage compartment is available. AFT Intl has recently decided to enlarge its range of the covering material “Thermytex”. This 100% synthetic covering material with a leather look is absorbent, breathable and is a very interesting alternative for real leather in terms of price vs quality. This material is available in a new and larger range of colours (also perforated) in large rolls, mini-rolls and sheets. In February 2015 AFT Intl has acquired the exclusive trademark and licence to distribute the only original PPT in Europe. Independent labs have proven that PPT absorb more shock than any other material in the orthopaedic industry, no matter how prolonged or repeated. PPT further distinguishes itself from other similar-PU foams by the fact that it is also available with two rough sides, which facilitates bonding. 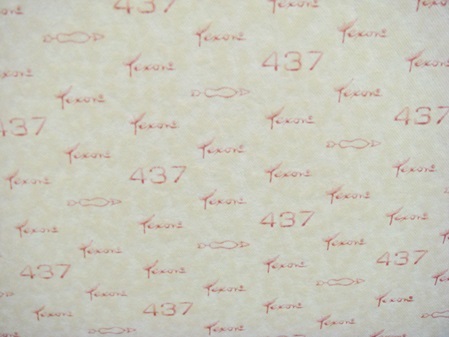 PPT is available in several thicknesses in large rolls, mini rolls and sheets in both tan and blue. Furthermore we have developed a PPT product with a slower rebounding effect, called PPT Slow Recovery. This article is only available in orange in several thicknesses. The first real mobile socket router allows fast, local corrections and finishes needless transports of workpieces to the central workshop. 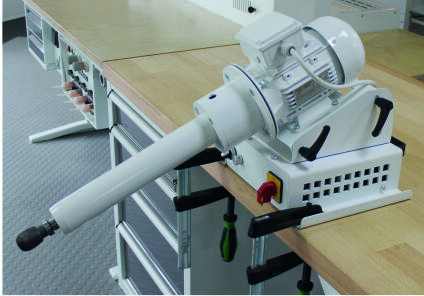 The MTF-Mobile long arm router is fitted with an infinitely variable speed regulation, and 2 screw clamps for quick mounting on a table. With the new case and the accommodated therein compartment for tools the new Pod 20 - Mobile become more compact. The integrated solid telescopic handle and the enlarged casters make this development even more flexible. The new test platforms of AFT International, with a ramp grade of 10% and two-sided stainless steel railings are available in 15 different versions. You have the choice between two to six stages and as a result different ramp lengths. Elegant design complete this product. Find the optimal stage matching to your room size at catalogue pages 96 and 97.
brings your patient into the correct position. A selection of different colours for the seat cushion completes the program. More information on our catalogue pages 88-95.